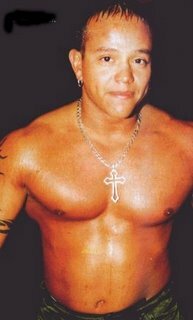 Óscar Gutiérrez Rubio, (born December 11, 1974 in San Diego, California) better known by his ring names Rey Misterio Jr. and Rey Mysterio is a Mexican-American professional wrestler currently performing for World Wrestling Entertainment (WWE) on the SmackDown!. Mysterio is known for his aerial wrestling techniques, which kick-started the “cruiserweight” revolution in the United States of America in the late ’90’s. He has won the WCW/WWE Cruiserweight championship eight times - more than anyone else in history. He’s touted as the greatest “underdog” champion of all time, given his height and weight compared to his opponents. Gutierrez is a lucha libre luchador as is his uncle and trainer, Rey Misterio, Sr. He debuted as a wrestler in April 1989 at the age of 14 in Tijuana, Mexico. He was too young to wrestle in the United States, as athletic commissions would not give him a license. Technically, he was also underage in Mexico, but enforcement was generally low. In Mexico, using the stage name Colibri (hummingbird in Spanish), he began a feud with another luchador, Psicosis (who was also trained by Rey Misterio, Sr.). This feud lasted several years even after Gutierrez’s career moved to the U.S. When he turned 18, his uncle allowed him to use the ring name “Rey Misterio, Jr.” Gutierrez later changed the spelling to “Rey Mysterio, Jr.” and eventually dropped the “Junior”. In Asistencia Asesoría y Administración (AAA) he feuded with Juventud Guerrera which included a tag match with Guiterrez & Misterio, Sr. versus Juventud and his father, Fuerza Guerrera. In 1995 he defeated Psicosis during their debut match on Extreme Championship Wrestling (ECW). This match was their first real impact in American professional wrestling, outside of the World Championship Wrestling (WCW)-promoted When Worlds Collide pay-per-view (PPV). Their feud stopped for a while after a Mexican Death Match in November 1995 at the ECW Arena in Philadelphia. Mysterio also appeared at the both One Night Stand], reunion shows, defeating Psicosis at the first and having a match with Sabu at the second which went to a no contest. After leaving ECW, Rey went on to gain fame in WCW, where he was the main wrestler to kickstart the new “Cruiserweight Revolution” in the United States in the late ’90’s. WCW ran an angle which promoted Rey as an “underdog”–he had a string of singles victories against behemoths such as Bam Bam Bigelow and Kevin Nash. His last name was changed to ‘Mysterio’ to be further marketed as a ‘Mystery man.’ In WCW, he had many famous matches with Ultimo Dragon, Dean Malenko, Psychosis, Eddie Guerrero, and Juventud Guerrera. He won the WCW Cruiserweight title five times (and 3 more in the WWE). In 1998, Rey was asked (and booked) to lose a match where the wager was Rey’s trademark mask. The Lucha Libre community was offended by this move (this lasted until WCW folded), because of the tradition of luchadors keeping their mask’s on. During his run in WCW, Mysterio was one of the company’s most popular superstars due to his high-flying, amazing, luchador style, how he always interacted with the fans, and his own personality, which was displayed in his clothing (on and off the ring), music, and approach. However, despite his immense popularity, WCW President Eric Bischoff refused to give Mysterio a shot at the WCW World Championship due to his being “too small” and “unmarketable.” Therefore, he was booked to lose his mask in a match. He would lose his mask and go on in the Filthy Animalz stable, winning the WCW Cruiserweight Tag Team Titles with Billy Kidman at the final WCW Monday Nitro. In 2002, Rey signed with WWE, but was asked to wear the mask again. In Mexico, one could be fined or even have their license suspended in lucha libre by the Box y Lucha Commission for this; there, once a wrestler loses his mask, he cannot regain it. In deference to this tradition, Mysterio continues to not wear a mask when performing in Mexico. This includes non-wrestling appearances in the Rey Mysterio: 619 DVD produced by WWE, although he wore a mask on the recent tour in Mexico on January 1 and January 20, 2006. 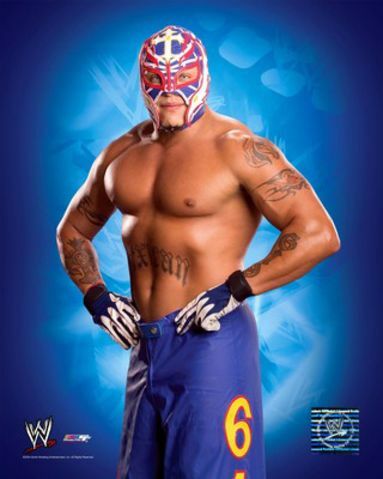 Rey Mysterio began his WWE career on SmackDown! as a babyface in a feud with Kurt Angle. Rey later teamed up with Edge to win the WWE Tag Team Championship but after the team lost the titles they soon stopped tagging together. Rey challenged WWE Cruiserweight champion Matt Hardy at WrestleMania XIX in Seattle, but was unsuccessful after numerous interferences by Shannon Moore. Mysterio finally beat Hardy for the title in an emotional match broadcasted on June 3rd in his hometown. He later lost the title to Tajiri. Rey later began to feud with Chavo Guerrero, Jr. and his father, again over the WWE Cruiserweight Championship. During this time, Mysterio teamed on occasion with Rob Van Dam, or Spike Dudley to face off against the Dudley Boyz. However, while Rey Mysterio was Cruiserweight Champion, Spike Dudley turned heel and joined with the other Dudleys before soon taking the Cruiserweight title from Mysterio. Rey continued to team with Rob Van Dam, and before long the team was able to take the WWE Tag Team Championship from Kenzo Suzuki and Rene Dupree. However, RVD became injured and Rey soon lost the titles to The Basham Brothers. On February 20, 2005, Rey won his third WWE Tag-Team Championship with Eddie Guerrero after defeating Doug Basham and Danny Basham (a.k.a The Basham Brothers) at WWE No Way Out 2005. However, in a departure from traditional booking, the new champions did not defend their titles at WrestleMania 21 on April 3, 2005, but instead faced one another, with Rey winning. This led to a storyline in which the team broke up and had Guerrero turn heel due to being frustrated by being unable to defeat Mysterio on various occasions. Guerrero and Rey continued to feud, with Guerrero threatening to reveal a secret he and Rey shared involving Rey’s son, Dominic. Unless Rey deferred to Guerrero’s authority, he threatened to go public with the secret. Guerrero later revealed that he was Dominic’s biological father. The storyline went that Guerrero knew Rey was having trouble starting his own family, so Guerrero left Dominik with Rey and his wife Angie to raise. In subsequent weeks, Guerrero threatened to take custody of Dominic, even drawing up custody papers and having his lawyer present them to Mysterio. At SummerSlam 2005, Rey defeated Guerrero in a Ladder Match for the custody of Dominic. Rey then became engaged in a brief feud with John “Bradshaw” Layfield with JBL eventually coming out the victor at No Mercy 2005. Rey also debuted a reggaeton song called Booyaka 619 where he sings along with Mad One in October of that year for new entrance music. On January 29, 2006 Rey Mysterio competed in the Royal Rumble’s “Royal Rumble match” where he entered in the number 2 position, lasting over an hour in the ring to finally eliminate Randy Orton and win the match. By winning the Royal Rumble match, Mysterio gained a World Heavyweight title shot at that years WrestleMania which would be the first time he competed for a World Title during a pay-per-view event. Also, Mysterio set a Royal Rumble record by lasting over 62 minutes in the match. Rey dedicated his fight, and his later win at the Royal Rumble to Eddie Guerrero. After his win, he was congratulated by Chris Benoit, Dean Malenko, Chavo Guerrero Jr. and Rob Van Dam - all old and close friends of Eddie Guerrero. During the February 3, 2006 episode of Smackdown!, an upset Randy Orton interrupted Mysterio’s victory speech to challenge him for his WrestleMania title shot. As Rey looked upward for guidance on this decision Orton verbally attacked him and the memory of Guerrero, saying “Eddie Guerrero isn’t in heaven, he’s ‘down there’– IN HELL!” Mysterio attacked Orton and later accepted the challenge. The challenge took place at No Way Out with Randy Orton defeating Rey Mysterio while illegally using the ring ropes to aid a pin. Having lost the title shot at WrestleMania 22, Rey cried backstage with a few of Guerrero’s close family. However on a later edition of Smackdown!, the sympathetic SmackDown! General Manager Theodore Long declared the World Title match would include Mysterio, making the match a Triple Threat that would see Rey face off against both Randy Orton and then-World Heavyweight Champion Kurt Angle. Some questioned Long’s decision, namely Orton, who was furious that he would not be the only one challenging for the title at WrestleMania. However, Angle, the champion, didn’t seem to care because he had no qualms about defeating the both of them. At WrestleMania 22 in Chicago, Mysterio became the World Heavyweight Champion by pinning Randy Orton in a Triple Threat Match, following a 619 and a West Coast Pop. San Diego based rock band P.O.D. performed Rey’s theme, “Booyaka 619″, live at WrestleMania. This victory was historic on many levels, as Mysterio became the shortest (5′3″) and lightest (165 lb) world champion in WWE history. He is the third masked wrestler (after Kane and Mankind) and third Hispanic wrestler (after Pedro Morales and Eddie Guerrero) to win a WWE world title. Following this victory, Mysterio was congratulated on the entrance ramp by Chavo Guerrero and Vickie Guerrero, and backstage by his good friend Chris Benoit. On the April 7, 2006 edition of SmackDown!, Rey Mysterio, who was billed as being an “underdog champion”, made his first successful World Heavyweight Title defense against Randy Orton. Mysterio went on to retain his title in a rematch against Kurt Angle before starting a feud with the United States Champion John “Bradshaw” Layfield. This feud with JBL saw Mysterio face off against any opponent of JBL’s choosing in the weeks leading up to his title match against Mysterio at WWE Judgement Day 2006. Mysterio was defeated by Mark Henry and squashed by The Great Khali in non-title singles matches before facing RAW’s Kane in a match, that went to a no contest, leading up to the PPV. He retained his title at Judgment Day using a frog splash to win the match. And the next SmackDown Rey faced JBL again, and the World Heavyweight Title was on the line. Beforehand, Mysterio played JBL’s own game from leading up to ‘Judgement Day’ by putting JBL in a title-defense match against Bobby Lashley. JBL lost the US championship which lead him to vow that if he didn’t win his match against Mysterio, he would quit. In the main event, JBL was beating Mysterio in the early going and even thought he had won it by pinning Mysterio. However, the referee then saw Mysterio’s foot on the ropes and cancelled his decision and continued the match. Mysterio won with a 619 and then a springboard legdrop to retain the World Heavyweight Championship and causing JBL to leave Smackdown! once and for all. Mysterio was defeated by Rob Van Dam at WWE vs. ECW Head to Head on June 7, 2006. Immediately after WWE vs. ECW, WWE.com reported that Paul Heyman approached Mysterio about jumping to ECW. It was announced on the June 9 edition of SmackDown that Rey would stay home, on WWE’s SmackDown!. After that, he would go on to be defeated by Finlay after ECW’s Sabu interfered. After the match, Sabu put Mysterio through a table as SmackDown! went off the air. At One Night Stand, he was met with loud boos from the hostile ECW crowd, who did not like the Smackdown! superstar. Mysterio retained his title after both men were ruled unable to continue following a DDT from Sabu which drove both men through a table. Mysterio would later defend his title against Mark Henry, he would win the match via DQ when he gave a chair to Henry and he lay on the ground motionless (one of Eddie Guerrero’s signature heel tactics). He would then feud with King Booker after Booker won a Battle Royal to see who would face Mysterio at The Great American Bash for the World Heavyweight Championship. Mysterio beat King Booker in a single match two days before The Great American Bash when Chavo helped him. .very nice post and very nice blog. i really really like m love u rey!hope one day we will meet.i am one of ur million fan!i am always here for u!i am krezh!from philippines!